The announcement of the new investigation came on the same day he met with leaders of the United States Church for crunch talks on the abuse crisis. As the moment the US cardinals arrived for their meeting with Francis in the Vatican’s apostolic palace, the Holy See announced the Pope had ordered Archbishop of Baltimore, William E. Lori, to investigate harassment allegations against West Virginia Bishop Michael Bransfield. A Vatican communique added that Francis had accepted Bishop Bransfield's resignation and handed executive responsibility of the Diocese of Wheeling-Charleston to Archbishop Lori as an apostolic administrator. He will take on this role in addition to leading the Archdiocese of Baltimore. During his meeting with Francis today, Cardinal Daniel DiNardo, President of the US Bishops’ Conference, said he told the Pope that sexual abuse had “lacerated” the Church in the United States. 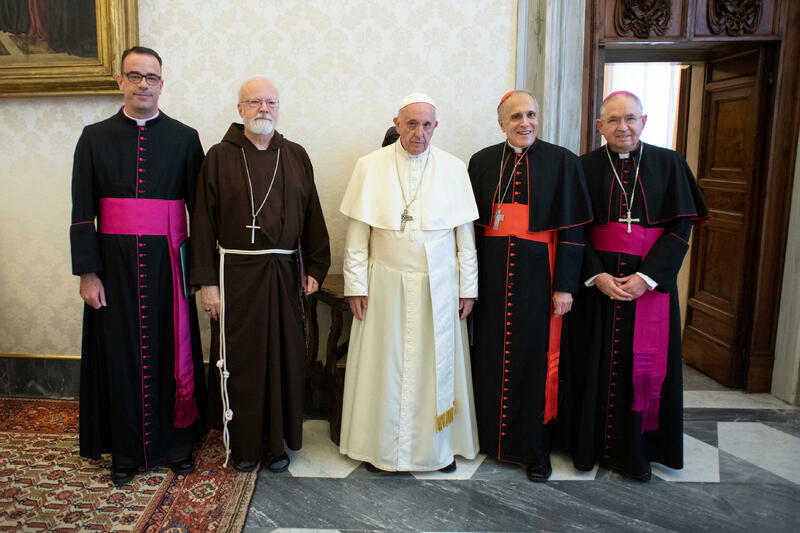 The US bishops pictured above are, from left, Archbishop Jose H. Gomez of Los Angeles, vice president of the conference, Cardinal Daniel N. DiNardo of Galveston-Houston, president of the conference, Cardinal Sean P. O'Malley of Boston, president of the Pontifical Commission for the Protection of Minors, and Msgr. J. Brian Bransfield, general secretary of the conference. The 81-year-old Jesuit Pontiff, the cardinal explained, “listened very deeply from the heart” during what was “a lengthy, fruitful, and good exchange”. Cardinal DiNardo, who was joined by Cardinal Sean O’Malley, the leader of the papal child protection commission, and Archbishop Jose Gomez of Los Angeles, the vice-president of the bishops’ conference, said the bishops were now “identifying the most effective next steps”, but did not spell out what those were. In a 16 August letter the cardinal wrote that the US bishops’ executive committee had agreed on a three-pronged response to the crisis which included an apostolic visitation “into the questions surrounding” Archbishop McCarrick, the opening of “new and confidential channels” for reporting complaints about bishops' misconduct and establishing more effective ways to resolve future complaints. There was no immediate indication from the Vatican as to whether the Pope would authorise a visitation into the McCarrick affair, although there is speculation that a lay-led board will be set up to investigate claims made against bishops. The crisis in the United States flared up this summer following the news that Archbishop McCarrick had been credibly accused of abusing a minor - which came alongside allegations involving seminarians - and a damning Grand Jury Report in Pennsylvania documenting child sexual abuse by 301 priests over a 70 year period across six dioceses. In a letter to priests, the 77-year-old cardinal wrote that he plans to meet with the Pope to discuss stepping down. As required by church law Cardinal Wuerl presented his resignation as archbishop on his 75th birthday but has come under pressure to relinquish his position following the Pennsylvania report. After launching a “season of healing” in the archdiocese on 14 September, the cardinal explained to his priests that “in the very near future” he plans “to meet with our Holy Father about the resignation I presented nearly three years ago, November 12, 2015". While the Vatican has so far not released any statement following the audience between the Pope and the US bishops, a transcript of remarks Francis made to Jesuits while in Ireland was published today by La Civilta Cattolica, a Jesuit publication which is overseen by the Secretariat of State. Bishop Michael Bransfield was an important figure in the Papal Foundation, a body which helps raise millions of dollars a year for Holy See projects and which Archbishop McCarrick helped to establish. The 75-year-old prelate also served as Rector of the Basilica of the National Shrine of the Immaculate Conception from 1990 until 2004, overlapping with the period that McCarrick led the Archdiocese of Washington (2000-2006). And in 2005 McCarrick was one of three bishop-consecrators who presided at Bishop Bransfield's ordination to the episcopate in 2005.